The IT security industry has been forced to adopt a reactive stance when it comes to the latest threats. Security vendors are constantly rushing to develop, test, and deploy new products in response to the most recent problem. And while they are succeeding, not everyone reaps the same benefits. Large businesses and corporations have several advantages over small and mid-sized businesses. They can afford to continuously purchase the latest upgrades as they hit the marketplace, and have dedicated teams that monitor and maintain the security and integrity of their systems and networks. In short, they have the luxury of staying current, and swapping out measures as the security landscape changes. For smaller businesses, this simply isn’t realistic. Your primary focus is on delivering your product or service, and putting the needs of your clients first. There is barely enough time in your day to tackle basic IT requirements, let alone research the latest security developments, and then deploy and maintain each new tool for each specific threat. While new programs and tools are being released all the time, not every upgrade offers real value to your business. The constant back-and-forth between security professionals and cybercriminals shows no sign of slowing down. In the long run, it’s more beneficial and cost-effective for you to invest in security measures that offer broad-spectrum protection as opposed to a variety of threat-specific measures. To make matters worse, developers have a tendency to flood the marketplace with products that are downright confusing to the average person. Reading through all of the odd acronyms and baffling technical jargon is no easy feat, and when you’re left utterly lost afterwards, it’s just frustrating. This is where the right IT provider can make a huge difference for your business. 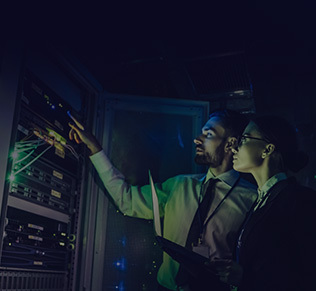 By partnering with a knowledgeable and experienced Managed Services Provider, you can save yourself the headache of trying to keep up with the rapidly shifting IT security world. We pride ourselves on staying current, and having the answers and solutions your business needs before you even realize the need is there. And by keeping on top of your business’ network security, we can take steps to protect your business from threats before they have the chance to cause issues and disruptions. The size of your business shouldn’t dictate the level of protection you have access to. Want to learn more about the IT security services Digivie offers? Contact us today at info@digivie.com or (613) 277-2312 . We’re the trusted IT experts for businesses in Ottawa.